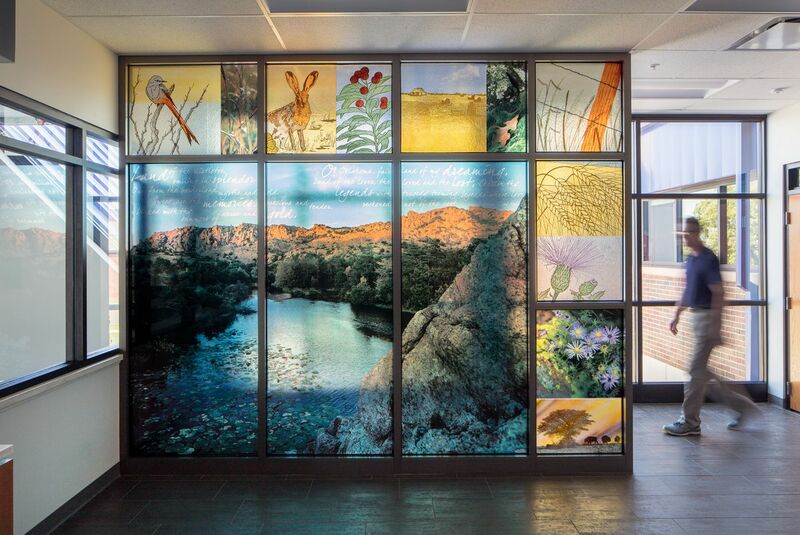 At the beginning of the month, we finally got to install our fine art glass installation called "Homeland" in the Oklahoma City Vezey Veterans Complex. The piece took over a year to complete from design to installation. It is comprised of many panels in a custom metal framework that divides the room. Some of the panels are cast glass with glass silkscreened imagery created by J. Gorsuch Collins, and those are paired with dye sublimated panels of photographs I took while we traveled through Oklahoma. It's a wonderful memory working on this with my mother and getting to know Oklahoma through the incredible beauty of the Tall Grass Prairie Preserve, Osage State Park and the Wichita Mountains. We felt a lot of responsibility creating work for Oklahoma veterans and their families. In this piece, we sought to explore the concept of home. Home encompasses our roots, our history, and all that we fight to protect. It’s who we are and what we long for when we’re far away. We felt this approach was appropriate for the setting, the new Veterans Affairs administrative offices in Oklahoma City. Its visitors are members of the military who often endure separations from home and great loss or sacrifice. This piece is a statement about where they come from and what they fight to protect.